SolFocus, Inc., developer of solar concentrator photovoltaic (CPV) systems, has signed a manufacturing and distribution agreement with Moser Baer India Ltd. (MBI) of New Delhi, India. MBI will become a volume manufacturer of SolFocus CPV products and the exclusive distributor of SolFocus’ CPV panels in India and neighboring countries. 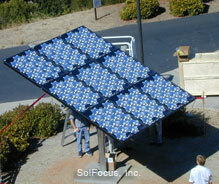 MBI also invested $7 million to close out SolFocus’ $32 million Series A funding. SolFocus has pilot production underway in Sunnyvale, California, where over 4,000 panels will be produced for extensive reliability and field testing. Pilot production and field tests at MBI are expected to begin in 2007. Commercial production is planned for 2008. Other sites in the US are also being considered for a large manufacturing facility that will serve the North American market. This announcement comes on the heels of a volume purchase agreement for 600,000 high efficiency PV cells from Spectrolab, a wholly-owned Boeing subsidiary. CPV systems use relatively inexpensive optics such as mirrors or lenses to “concentrate” or focus light from a relatively broad collection area onto a much smaller area of active semiconductor PV cell material. Since the silicon in solar cells usually dominates the costs of the solar PV system, reducing the amount of silicon leads to substantially lower system cost and resulting cost per watt of output. For higher concentrations that reduce silicon use by 100-1000 times more, it is cost-effective to use higher efficiency cells, such as the Spectrolab cells that SolFocus is using, that increase the electricity generated from a given collection area—even though this PV material can cost up to ten times more than regular cells. Their first generation product combines a primary mirror, tailored to a secondary mirror, which are both mounted to a front window. These mirrors focus the sun's energy onto an optical rod, which guides the sunlight onto to the triple-junction cell. This design delivers a wide acceptance angle (+/-1°), which enhances manufacturability, and a thin panel profile, which reduces weight, installation complexity, and cost. The high-efficiency cells are mounted to a heat spreader for passive cooling. This results in a fully enclosed, extremely strong, compact panel with no moving parts, effectively achieving low cost with high reliability in a fundamentally safe architecture. According to a November 2005 presentation to NREL the target installed cost for systems in high volume production is $1.00/W. The cost of goods sold (COGS) is projected to reach $0.55/W at 1 GW/yr for Gen1 modules. They plan on selling about 2 MW of Gen1 modules to early adopters at approximately $5.00/W. 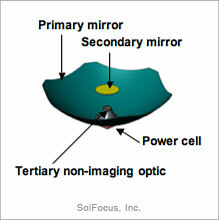 A more comprehensive post on SolFocus can be found here. To my knowledge this is the first of the compact CPV developers to announce production plans. Their pricing should be very competitive and it will be interesting to watch their progress and see if this is a disruptive technology. I hope someone will correct me if I've made a mistake in my back of the envelope calculations, but with an installed cost of $1 per watt, then in a sunny location each dollar invested in this system should produce about 2 kilowatt-hours a year, much of it during periods of peak electrical use. If this power would normally cost 10 cents a kilowatt-hour then an investment in these solar collectors would pay for themselves in five years with a 20% rate of return. It would be hard to imagine that there would be any companies that wouldn't consider this to be a good investment. The early adopters who are expected to have installed costs of $5 a watt will have a 20 year pay back time, but as soon as the installed cost comes down to about $2.50 a watt many companies and private individuals will find them a money saving proposition. If the installed cost comes down to $2.50 a watt I don't see how they could fail to become widely used. In my neck of the woods, local oppositions such as Home Owners Association, local ordinance, and uncooperative utilities not only raise cost for installation, but effectively prohibit installation of private wind and solar generation. As the cost for electricity goes up, I’m sure things will change. For now, I think as price per watt comes down, the core consumers will be the most progressive municipalities, rather than private businesses or individual homeowners. Ronald, that is correct. However, note that $1/W is the *target* installed cost for Gen2 modules. If you read the previous post on SolFocus (linked at the end of this post), their current installed cost is around $3.5/W. I enjoyed visiting your site and browsing your interesting blog posts. Lots of good info here.